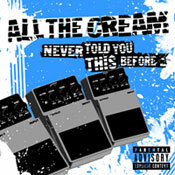 ALL THE CREAM was formed in Vigo (NW Spain) in 2004. At that time the four are between 14 and 15 years old, so now they are between 17 and 18 years old and they keep the freshness and the intensity of those who are going away to eat the world to bites. "We are simply four very lucky friends doing what more we like in this life that is to play music”. In June of 2005 they recorded in just 7 hours his first demo tape with Eladio (Medusa) as producer. Thanks to this demo are able to play frequently in Galicia (La Fábrica de Chocolate, La Iguana, Sete Mares, Anoeta, etc...) and to arrive until all the north. From this demo, "Let us play" became a local hymn (a promising advance of which it was to come). “The best thing of everything is people’s answer in a concert, or to discover to somebody that you do not know singing your songs, there’s no money to pay it”. In their long list of influences it is possible to be found Blink 182, Green Day, The Ataris, etc... and the one that there is to add that "something" special that must contribute the wind that arrives from Atlantic Ocean, but know very clearly that "we will always be punk-popers". “At the hour to compose we did not close any door, we are creating songs with different influences as the metal, the most commercial pop, the indie alternative rock, conserving always our distinguishing, melodic essence, their own brand”. ALL THE CREAM have more to explain and this 5 new songs are just the beggining: “How the middle-class suburbia kids waste their time”, “One for the kids”, “Nunca !” (the only one in Spanish), “Everything’s OK” & “Hooray !” the first hit single.